We start with Hulk with his beloved Jarella. They are happy and getting married – until a hand comes out of the heavens saying “Jarella, you are needed elsewhere” and snatches Jarella. The Hulk tries to fight but is just taken out of K’ai. We then join the Hulk standing in the desert with The Grandmaster. He asks Hulk if he would like to see Jarella. He says Jarella is dead. The Grandmaster replies “No kidding, Captain Obvious” – just kidding – he actually tells the Hulk if he picks a team and participates in a game – to the death – and wins, then he can have his precious Jarella back. Hulk says he knows who to ask. We join The Silver Surfer as he tells Shalla-Bal that he has spared the planet – but now must go work for Galactus and leave her. The Hulk shows up and asks the Surfer for help. The Surfer has no idea who the Hulk is – because they haven’t met yet – and Galactus calls for his herald. Galactus realizes there is an Elder at work behind Hulk’s appearance. He grants the Surfer 24 hours to leave and deal with this. Next, we find Namor on his wedding day (do you see where this is going?) with his wife Lady Dorma who has already died and the Surfer asks Namor for his help. Lastly, we join Strange – in another universe – as his love Clea is taken away as well. When Hulk’s team is finally joined together they are faced with the Grandmaster who lets them know that each of the heroes are from a different time and then introduces his brother – The Collector – who asks if his brother is ready. He claims he has his own team with the other Hulk. Hulk screams “What other Hulk!? !” And we see the Red Hulk with his team “The Offenders” consisting of Tiger Shark, Baron Mordo, and Terrax. This is more like a diorama rather than just a statue. Showing Banner slowly turn into Hulk. 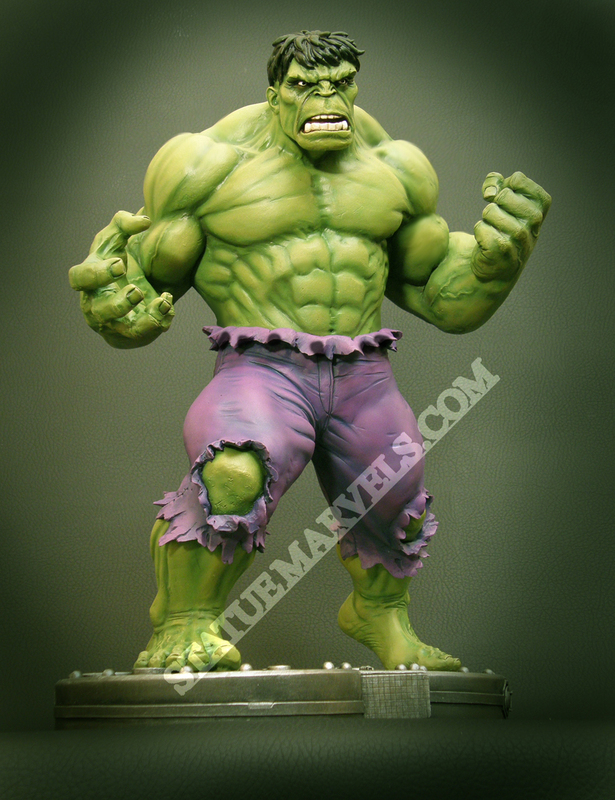 I have the green version of this statue – it was actually the very first statue I ever bought… on layaway. When I actually got to take it home it was already worthless. 🙂 I have no worries though – it’s not like I would try to sell it anyways. But now, onto this statue. Sometimes ebay actually has a good deal or two – and this was one of those times. I saw this auction starting at $24.99 – and I waited… no one seemed to be bidding. I waited the auction down to the last few minutes and finally set in my higest bid – at $25.00. That’s right, I wasn’t going two pennies over the starting price. Luckily, no one else was either. Most people wouldn’t bother with this statue – and I agree that there are much better representations of the Hulk, but this staue is unique. It’s one of the only ones that show the transformation – and it has sentimental value to me 🙂 They made 250 of these and mine is #213. The kids costume is fine. I love when kids dress up like the Hulk – except… why is the sides of his head blue? And what is he grabbing for down there – geez kid, have a little dignity! Oh, wait, is he trying to steal something? Oh, in that case – it’s totally fine. I know it’s still a while till we actually get to see these – but oh man, this guy looks so good! Save your money now! I just looked back and realized I never showed you the other Regener8r’s I picked up. This makes 3 – the 2 others I posted back in January. The image on the bottom of the car is one of the coolest images – mainly because it’s based on Deodato Jr.’s cover from Incredible Hulk #60. That’s one of the covers I would totally pay thousands for and never look back! Alright, now, this weekend extra specially Hulky! Man, that sounds so gay… but it was. I picked up the new BD Abomination statue – also the kit I had painted up finally came in – I am psyched! Tomorrow I have some pics from around the net – but I will be posting one of the new statues that I purchased on Wednesday. I will have to decide which one – but I will say this – if you have a preference leave a comment below. I’m not saying it will change my mind on which one to show – it’s just interesting to hear what people like to look at. I found this artist off this website: http://comicartcommissions.com/ Her name is Sherry Leak. She has a real manga feel to her art – and while a very different take on the Hulk – I really like it! I asked for her to have Hulk vs. Valkyrie piece – and that is what she delivered – although that’s the most interesting attack pose for Valkyrie to take… is she flying? Is she standing on the wall? All I know is I was pleased with this piece. Sherry was a wonderful artist to work with and I wish her lots of luck in the future! Have a great weekend – although I have been mucho busy lately I am posting pretty regularly – even though I’ve missed a few days. The sad truth is… I have shown a great percentage of the collection. Now, I didn’t say all – and I am still getting Hulk stuff from day to day – but most of the collection has been shown. I do have a few big pieces to show you – I also will be picking up my Bowen Abomination statue this weekend – and my new passion is for collecting some original artwork – but truth be told – I’m not sure how much longer I will be able to post new things day to day. That being said, I will make sure I post every time I have something new and plan on keeping this site up and running for a while, mainly because since I have started this site I have talked to, met, or just plain ogled over many of Hulk collectors out there. We are a really great, and loyal and very helpful group of people – the people I have met. I’ve enjoyed speaking with the many people I have met and look forward to continue meeting all sorts of people who visit my site. I think I’m just rambling now, so… goodnight – have a good weekend – I will be back on Monday, and as always, thanks for visiting the site. Anyways, I really have no complaints about this collection. If you were to read straight through the Hulk’s library the story of Jarella, you would find, is sprinkled sporadically throughout the series. The first appearance of the Hulk’s green lady is #140 (The issue preceding the first appearance of Doc Samson) and then we didn’t hear from that character again for 8 issues – from there it was another 8 issues till we had to wait almost 50 issues to see the jade beauty! It was so interesting reading through this storyline – mainly because the first story was plotted out and drawn by a different creative team then the second half of this story. The first few stories were drawn by Herb Trimpe while the second half was drawn by Sal Buscema. Without giving too much away – because this is one that you should pick up for yourselves – it collects 12 issues from #140 – #248 and What If…? #23. We join the Hulk as a classic Hulk villain, Psyklops, is using a ray to shrink the Hulk – to smaller than an atom – onto a world where he battles strange creatures and is welcomed by a race of green people and their leader – Queen Jarella – who immediately takes the Hulk as the King of their land. But things don’t stay peaches and cream for long – Visis, Jarella’s Brother, wants the throne for himself. By the way, magicians have not only cast a spell so that Hulk can understand and speak their language but also have the mind of Bruce Banner. It’s one of the most interesting points of the series. The different dynamic of seeing Jarella deal with the Hulk’s different incarnations – Hulk with Banner’s brain, Bruce Banner, Hulk with Hulk’s brain, in a rage/happy. It was such a treat to read this whole run – although it did remind me of Planet Hulk… a lot. There were a lot of similarities to the PH storyline, such as: Hulk has to fight on a strange land, Hulk is made King, Hulk has a love – but all in all there are enough differences that both stories stand on their own amazingly. There were a few different times that Hulk was shrunk – once by a very jealous and enraged Glen Talbot, who blamed the Hulk for his making his marriage to Betty dissolve. But, as most Hulk fans know, Jarella dies. Very tragically and very heroically. The Hulk goes back to K’ai (Jarella’s home world) once more – in one of the best stories of the whole book – to bury Jarella’s body. He fights one of the coolest villains with the stupidest names – The Gardener. I told you the name was stupid – but he can control the plants, water, and animals. The biggest treat of this collection is that they added the What If…? #23 where the Watcher asks “What if Jarella never died?” We get a great story – but also discover the mysterious villain who had sent Crypto Man from issue #205. I can’t recommend getting this trade enough – in fact log onto amazon.com and find a copy for yourself right away! The only thing missing is the issues that Peter David wrote where the Grey Hulk travelled to K’ai – but I have those issues already reprinted in Hulk Visionaries: Peter David Volume 3.